One of the pleasures of living in West London is the human scale and quality of its architecture. 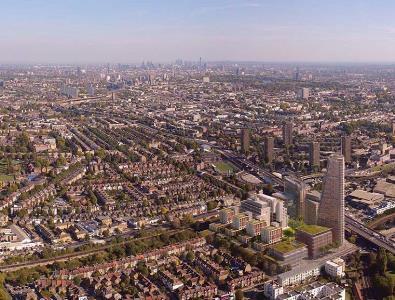 Although an area densely built by any standards, West London has been largely spared from the current wave of tall buildings that have sprung up in other parts of the capital over the past decade. Yet the proposed skyscrapers at Old Oak common could change all of this. Trellick Tower in North Kensington was completed in 1972, at a time when tall buildings were going out of fashion. Now a Grade 2 listed building, its 31 storeys stand in relative isolation. Kensington and Chelsea Council has since refused to give consent to other tall towers. Not so other London boroughs. The most recent snapshot survey from New London Architecture identifies 436 tall buildings in London’s planning pipeline, with Tower Hamlets, Greenwich and Croydon as hotspots. South of the Thames, the skyline of Vauxhall, Nine Elms and Battersea has irrevocably changed. While skyscrapers have their fans, many Londoners do not want to see the spread of poorly designed apartment towers across all parts of the city. View of the proposed Imperial West development, with StQW neighbourhood to the left. This threat is very real for West London. Hammersmith and Fulham granted planning permission some years back to a series of towers, now under construction at Imperial West on Wood Lane, and at the new phase of Westfield. More significantly, the Old Oak area around Wormwood Scrubs is seeing the first few approvals for 20-40 storey towers, in the area described by former London Mayor Boris Johnson as the future ‘Canary Wharf of the West’. Planning decisions for this part of Hammersmith, Ealing, and Brent are made by the Old Oak and Park Royal Development Corporation (OPDC), a Mayoral body which started life in 2015. Preparation of an OPDC Local Plan is still at an early stage. New Mayor of London Sadiq Khan may not be such a supporter of tall buildings as Boris, but he has ambitious targets for new housing. The emerging OPDC Local Plan assumes 24,500 new homes at Old Oak, built at densities of up to 600 homes per hectare. This is six times the density of the Old Oak Estate, an attractive ‘cottage estate’ of public housing built by the London County Council after the 1914-18 war. It is not clear why the state’s vision of affordable homes for Londoners has changed so much over a century. London Plan policies on building height and density have been routinely exceeded in recent years, and the London development industry has become very wedded to tower blocks of privately rented flats. Construction of the planned HS2 and Crossrail interchange at Old Oak Common will not be completed until 2026, but meanwhile the developers are moving in to exploit the benefits of future high levels of public transport access. For existing residents in this part of London, Crossrail and HS2’s fast connection to Birmingham will bring benefits. But these will come at a high price in terms of loss of the open skylines and views to the west that this part of London has hitherto experienced. Gone will be the feel that we live near the edge of a great city, and gone will be the sunsets in the evening. 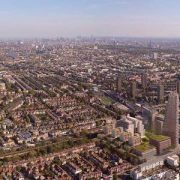 Resident and amenity groups, including the Hammersmith Society, Friends of Wormwood Scrubs, and others have been working together to try to ensure that existing London Plan policies on building heights and densities are met. But ‘intensification’ is the name of the game for Old Oak, and to developers that means clusters of towers of up to 50 storeys or more. On the evidence to date, there is no sign that this part of London will be spared the poor designs and incoherent siting of tall buildings that has led to the rash of what is now being called ‘Nine Elms Disease’ south of the Thames. CGI image of the Oaklands development, Old Oak Common Lane, NW10. Imperial West – the new campus for Imperial College approved by Hammersmith and Fulham Council in 2013, with several buildings now completed and foundations underway for a 35 storey residential tower next to the Westway roundabout. Oaklands – a joint venture of 605 housing units by QPR Football Club and Genesis Housing Association on Old Oak Common Lane. The design of the blocks (up to 26 storeys) was heavily criticised by Hammersmith and Fulham Council but recently approved by the OPDC Planning Committee. 6 Portal Way – a residential tower of 578 flats and 42 storeys at North Acton, approved by Ealing Council in July 2016 month despite local protests. 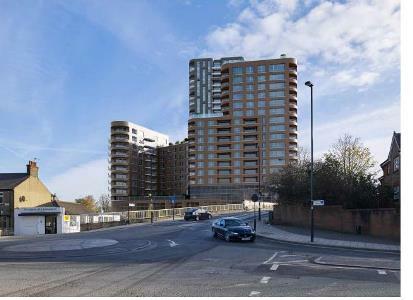 A further scheme by developers Aurora is at advanced pre-application stage and involves two towers on Scrubs Lane NW10. The developers have cheekily badged this development as ‘North Kensington Gate’ when it is in fact in North Hammersmith. The first part of the Old Oak area to have a comprehensive master plan is the 46 acre site owned by car traders Cargiant. With their partner London and Regional Properties, Cargiant’s team of planners and architects have worked up detailed proposals for ‘Old Oak Park’, a development of 6,500 new homes and 8,000 new jobs. The proposals have been refined through four rounds of public consultation, and as a result the plans and CGI images of the development are being better received by local people than the other schemes shown above. Old Oak Park will not be built out for several years yet, once Cargiant’s existing business has relocated. But an application for outline planning permission is imminent and the big decisions for this area are not long away. The stated ambition of the Old Oak and Park Royal Development Corporation is to provide a successful new area of London as ‘a place to live and work’, and ‘to visit and enjoy, time and time again’. Will this ambition become a reality? Experience of major regeneration projects in London, including Kings Cross and the Olympic Park in East London (now overseen by the London Legacy Development Corporation) leaves local residents unconvinced. The planning approvals granted in recent months have not inspired confidence. 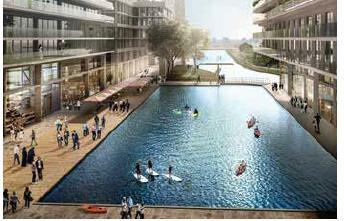 CGI image of Old Oak Park development. For a whole host of reasons, the UK planning system (when coupled with a dysfunctional London housing market and commercial developers keen on quick profits) does not seem to create ‘places to visit, time and time again’. Other European capitals, often regenerating areas more incrementally, provide better examples. Central Paris, Madrid, Barcelona, and Vienna are places deservedly loved by their residents, as well as by visitors. Their urban form works well. Our climate is not ideal for outdoor public space at the best of times, so is it wise to end up with buildings of 12-20 storeys which create sunless canyons and wind tunnels? Old Oak is London’s largest regeneration project. Let us hope it proves to be something that Londoners can be proud of in twenty years time. Local residents will be working with organisations such as Create Streets and the Skyline Campaign to try to achieve some innovative thinking on building design, density and height. An interim Old Oak neighbourhood forum has already formed, and will be seeking approval from the OPDC to put together a neighbourhood plan, as a vehicle for new ideas. We will be doing all we can to avoid the spread of Nine Elms Disease to the surroundings of Wormwood Scrubs. You are very welcome to contact the Old Oak Interim Neighbourhood Forum at info@stqw.org if you would like to be kept up to date on what is happening at Old Oak. The area will be a construction site for the next decade at least, and it is too early to say whether the eventual impact on the northern parts of Kensington and Hammersmith, and the eastern part of Ealing will be positive or negative overall. Anyone thinking of buying a home in the area should at least make sure that they are well informed. Chair of the St Quintin and Woodlands Neighbourhood Forum and adviser to the Old Oak interim Neighbourhood Forum.